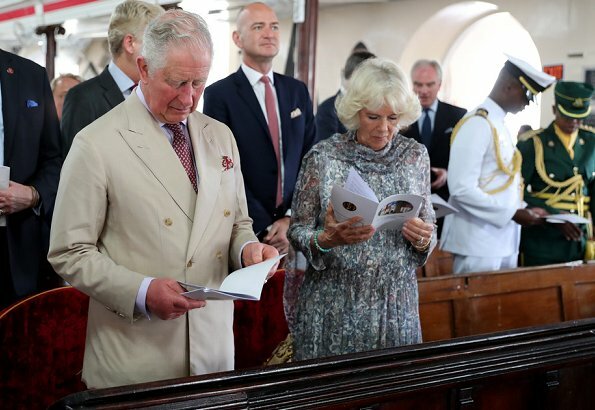 Before departing Barbados, The Prince of Wales and The Duchess of Cornwall attended a Church Service at St. Michael’s Cathedral in Bridgetown, Barbados. 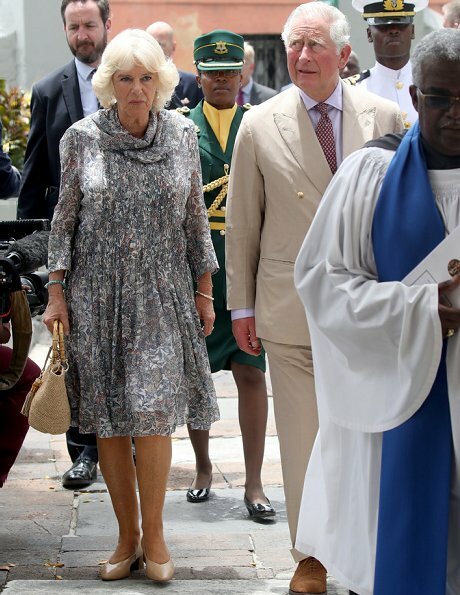 The Prince of Wales and Duchess of Cornwall will visit Cuba’s capital, Havana, on March 24. 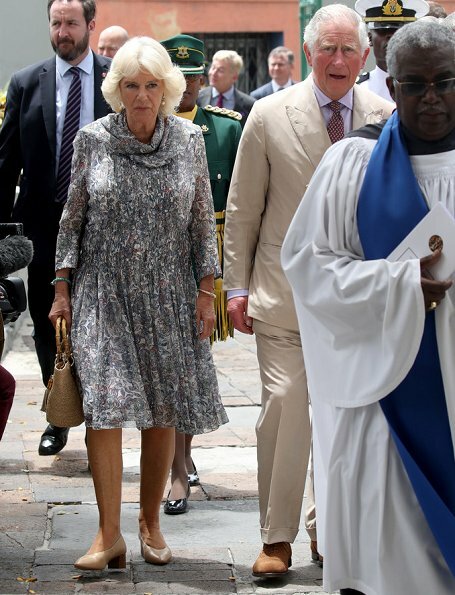 This will be the first official visit by a member of The Royal Family to Cuba. 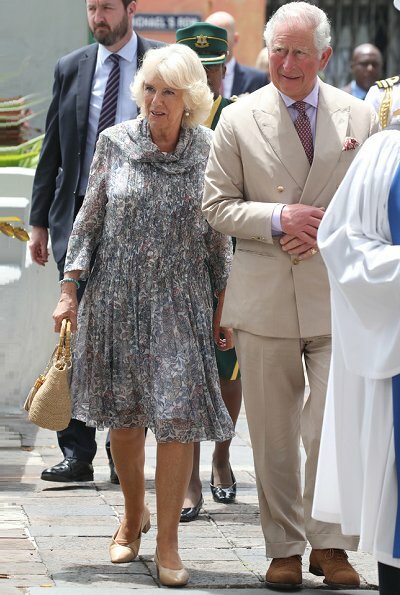 Their Royal Highnesses will pay an official visit to the Cayman Islands on March 27. 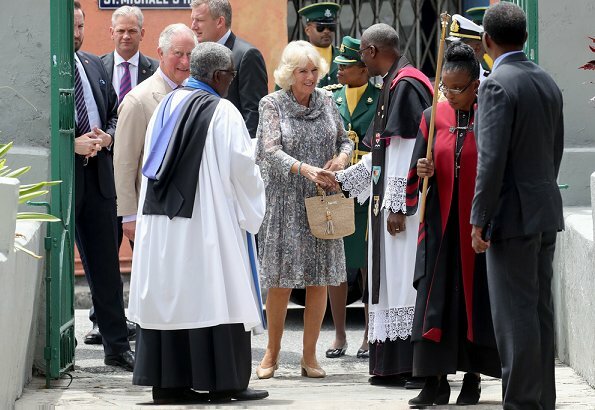 I like Camilla´s dress, nice change indeed from the parade of caftan-like long blouses (although I like those too, just don´t want to see them *all* the time). Charles is one of the best dressed royal men, and I enjoy seeing his suits in various bright summery colours. I must say though, that he´s had a few of seemingly poor quality lately as the material seems to pull and wrinkle. It´s either too thin to keep the right shape, or it´s affected by the heat during this trip. 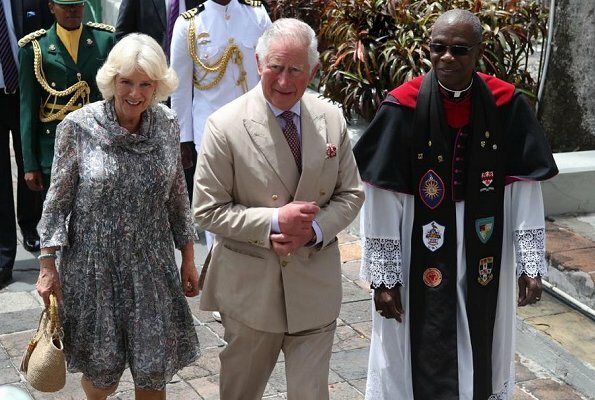 Charles’s suits probably have a high linen content which as we know is much cooler especially in the tropical heat but doesn’t hold a “press” as well. I wouldn’t enjoy walking around in a suit and tie but he does it very well. IMO Camilla has been perfect for every occasion. Caftans and loose pants are the answer to keep cool and hers have been lovely. If her socks showed a bit, that’s ok - better than blisters. I thought of linen myself but given its disadvantages, I thought na, he wouldn´t :-) But I guess you´re probably right. Linen is a valuable, comfortable and very breathable fabric, so not an unlikely choice. Too bad it wrinkles so badly. She always looks so well put together, bravo. I like her kaftans too, they look so comfortable. Nice couple they are very well suited. This pair is made in heaven. Weer een mooie jurk, Camilla weet wat mooi is voor haar figuur. En voor de gelegenheid. De laatste tijd begin ik ook Charles outfits te bewonderen, knap dit lichte pak. Charles wears top quality clothes, but they can be decades old and therefore look not so nice. 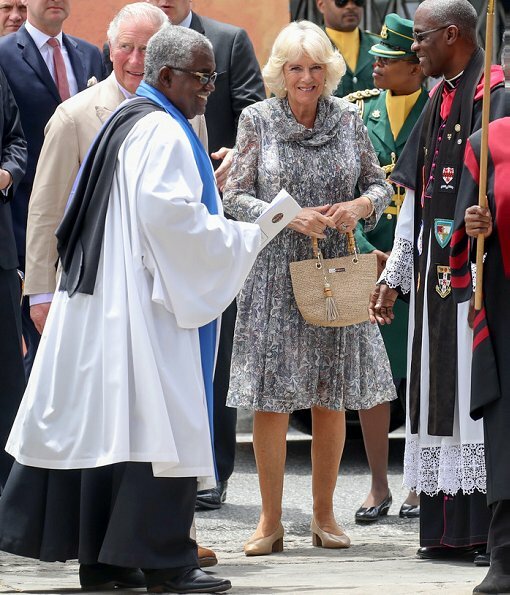 Agree that the dress is a welcome change of pace, looks cool and comfortable and certainly was a perfect choice for the church service they attended. Variety is a challenge, the Duchess is looking lovely. Love this dress. Historic State Visit to Cuba. Well someone has to open the door for others. These two are a lovely couple, they also enjoy working together.